To KonMari or Not? That is the question. To KonMari or Not To? That is the question. To KonMari or not? That is the question! Is this method of organizing life changing? Or just too much? 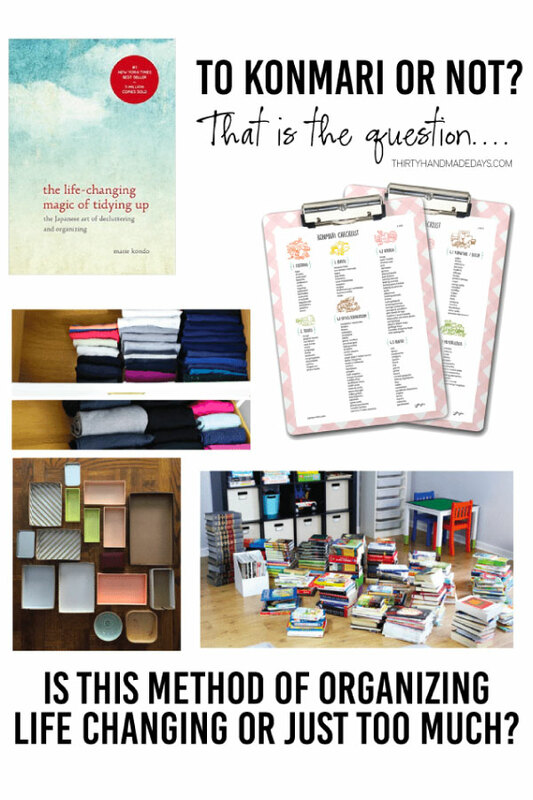 I’ve talked a bunch about organizing (or my lack thereof) over the years. If you follow me on Instagram, you probably have noticed that more posts have been about my house and organizing each room. 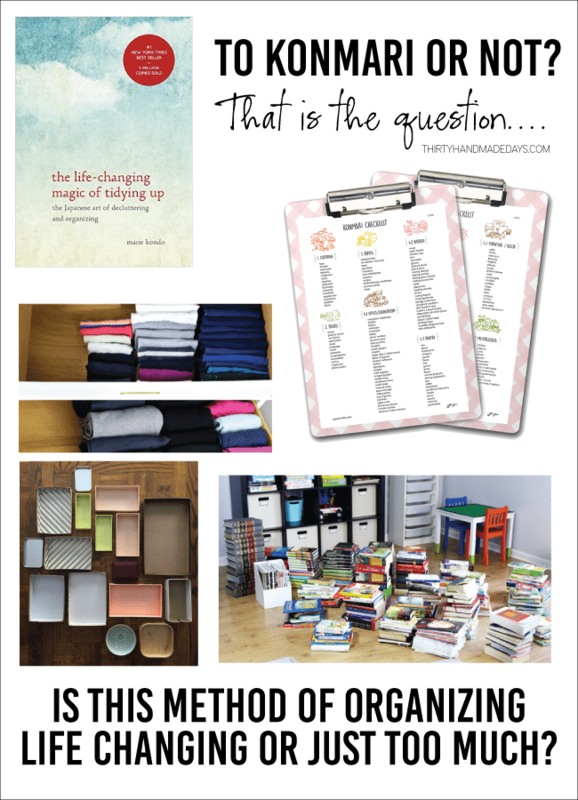 Lately when I post anywhere about organizing tons of people ask if I’ve read the book “The Life-Changing Book of Tidying Up: the Japanese Way of Cleaning Up and Decluttering ” by Marie Kondo. (affiliate) Let me preface this with – no I have not. But it seems like that’s all I ever hear about anymore. I have been curious as I’ve heard pretty mixed reviews. So I went online to research a little more (I’m an all or nothing kind of girl – definitely working on more balance- but I want to make sure that if I say I’m going to do something, I will actually do it) and was amazed at the tons of articles and posts that are out there. I thought some of you might enjoy the posts too. Brit + Co gave a great breakdown of what the KonMari Method was all about. This is amazing!! 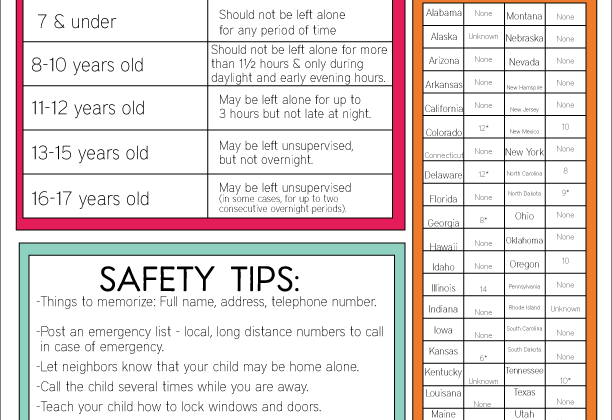 The graphics and printables are just so adorable and makes me want to jump in 110%! Even though they had recently gone through a lot of their clothes, Abby and her husband threw them all in a pile and went for it. I love all the information she posted and the pictures of how to fold the clothes using this method. It makes me want to throw all our clothes in a big pile too! Another post that is inspiring as well. Going from room to room, gathering all the books in her house, Abby ended up getting rid of a lot of books! Something we definitely could benefit from in our home. After reading the book, she used things she had around the house to transform her junk drawers. Wow! 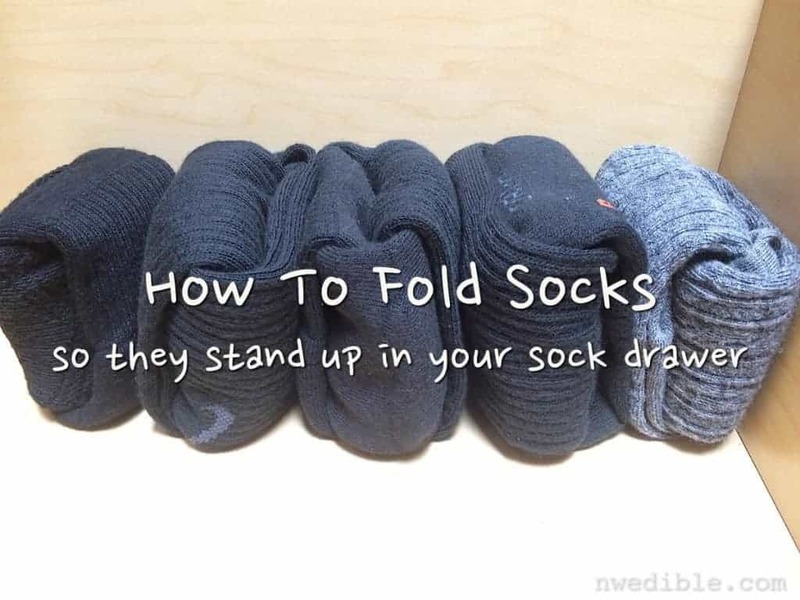 In this post, Erica breaks down the best way to fold socks so that they stand up. I’ve heard one of the big things talked about in the book is how to fold your clothes in your drawer. People say it’s life changing. I haven’t tested that out yet..
She even has a video for you! 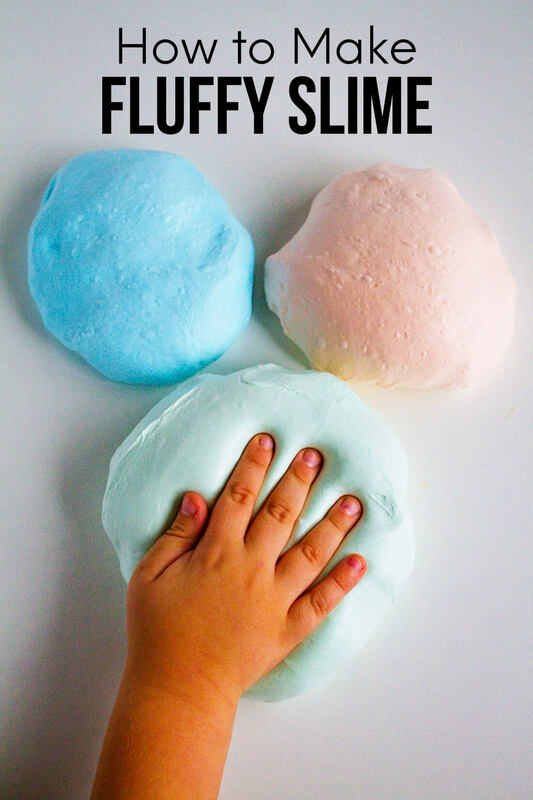 Another view from Cool Mom Picks – Does it really work for families? 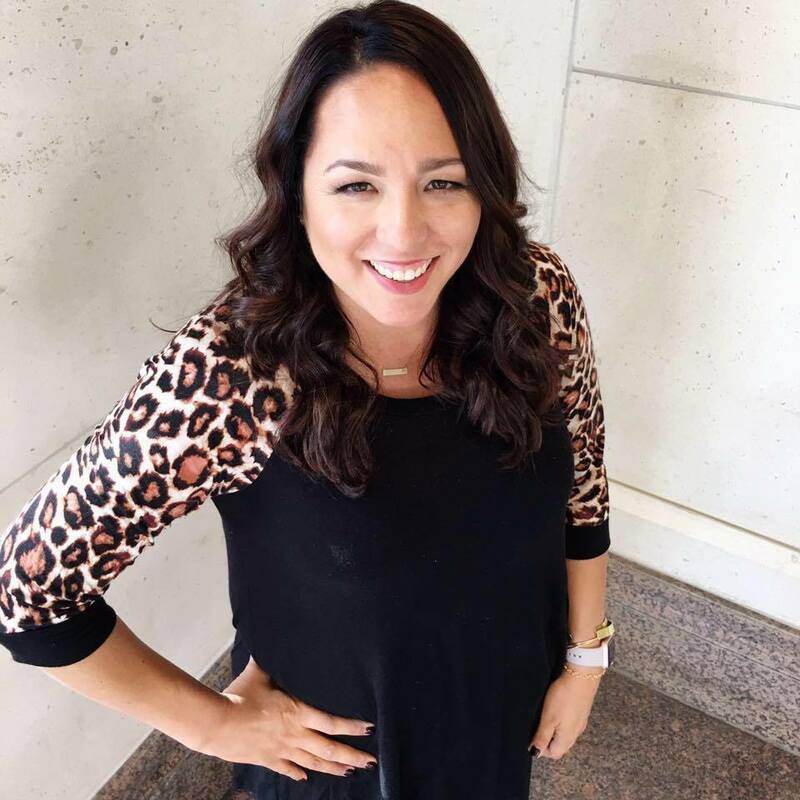 Read what she has to say, pros and cons of how this method will work with families. I have teenagers. They can be a hard bunch. In this post, Kate explains the best way to go about organizing with them to make it successful. Thank you Kate! After sorting through all of these posts, I decided it was worth the $11 investment and hours to read the book. Although I am a little scared… I will survive this, right guys? I’ve started the process (my clothes and books are all I’ve done so far) but I do enjoy it. I did the clothes folding, and while I think the idea of my clothes on the bottom of a pile “feeling squished” is silly, I love the vertical method for my own ease of use. I like the idea of help, motivationally, to clean up my house. But this book is…it’s too much. I don’t really care what the reasoning is, I’m not going to fold my darned socks (ha!) – I’m a firm believer that life is too short of matching socks, and I purposefully have multi-patterned pairs, all in a box, and will grab whatever pattern sounds best for the day. And while taking everything out of a certain area or box or closet or whatever to go through it makes sense, I don’t have the energy or attention span to go through it all *and* put everything back. The “big pile o’ stuff” on the floor isn’t going to make me want to clean it up, but to get back in bed for the day! So glad you gave examples to so many perspectives including the one with families. I have read the book and I think the fact it is written from a single woman’s perspective and not one with three kids, husband and a dog is what has held me back from starting. Cool Mom Picks was refreshing to read and now I think I am ready to take that first step. Enjoy the book and looking forward to your future posts once you start your “joy” journey! Thank you so much for featuring my KonMari posts, Mique! We have loved what her method has done for the organization of our home! Hope you’re having a wonderful week!